ATTENTION all early van owners… Overhaulin is coming to the 40th Van Nationals. We’re going to have a second generation Chevy van build. The build is going to be a 700-R4 modification with a throttle body injection system to go with it. Completing this overhaul will include a B&M shifter install as well as power windows and felts to accompany it. I also heard something about a new glove box install and something about a windshield as well. This will be a hands-on, where you can ask the build crew, whatever you want, plus see for yourself just how this all goes together. Be sure to watch for information on just where and when this will take place during the Warm-up Party for the 40th Van Nationals. Trust me; you will all be within a walk and a beer from this amazing build. Many thanks go out to the people who made this build possible, right before your eyes. That list is just too long to put here but, they will all get their kudos if you know what I mean. 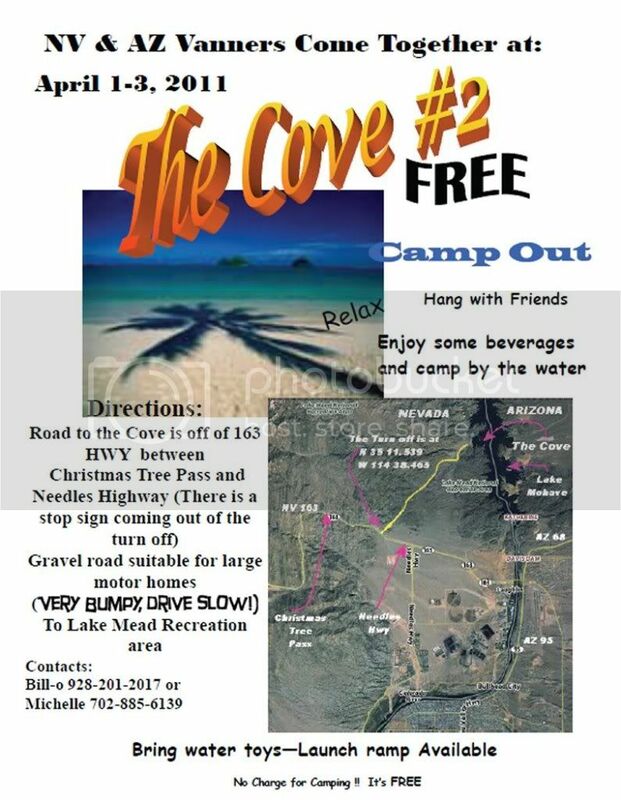 The Cove #2 April 1-3, 2011 - Arizona / Nevada Free van run ! This section will feature information, fliers, and links for upcoming vanning events, as well as followup reports and photos from previous events. I'm hoping to be able to add communal photo albums for events, so everyone can add to them. That feature is supposed to be available in the next software update.